For the fifth adventure, we head to the mist-shrouded isle of Tannòch. Three ogres have descended on this ancient, holy place, devouring the peaceful order that dwelled there. But food is not all they're after! Tannòch is a little different than earlier adventures. The geography is a bit simpler, but because the inhabitants are highly mobile, the adventure could go down many different ways. To adventurers, the water-filled crack practically has 'start here!' written on it. You might decide to move its entrance to the far side of the island, rewarding careful players. And where will Molluck make his appearance? He's too big for the narrowest fissures, but an aquatic ogre is an awful surprise when you're treading water, trying to pick a climbing route. As with Serimet, while the ogres are the apparent antagonists, less scrupulous PCs might side with them in order to get some loot. Marta won't willingly part with a single coin, certainly not one of the potent magics! And for that matter, the order isn't that squeaky clean either, providing succor to the very worst of society. 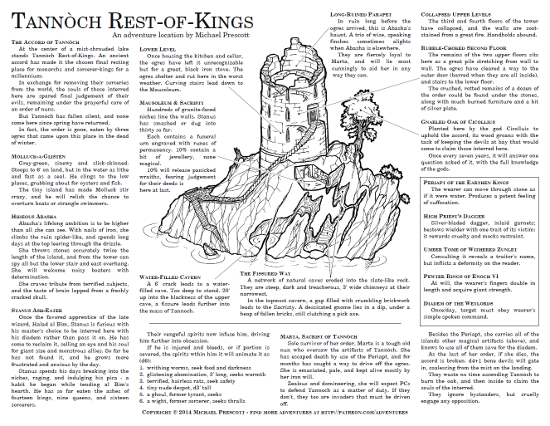 Tannòch should be dead easy to plop into your campaign's wilderness map. The best place would be on a lake or wide river that divides kingdoms, perhaps a corner where three kingdoms join - or better yet, ground contested by half a dozen feudal warlords. This makes Tannòch's spiritual gray area a temporal one as well, and ensures a steady supply of atrocity-laden souls looking for protection! The Patreon campaign has gone swimmingly - I'm really grateful for the support of my backers, all of whom have signed on despite this being very early days. We've blown by the first few milestones, so from now on I'm releasing all of the adventures under the Creative Commons cc-by-nc license. I'm also releasing the art! Here's a high-res TIFF of the island drawing. It's cc-by-nc too, so have fun with it. Many of you have had kind things to say, which is awesome. In your feedback you've requested things like single-building set pieces, encounters that fit into the wilderness (rather than dungeons), more dungeons, and above all else, more cut-away 3D maps. I'm especially grateful for your word of mouth, since I've turned into that loathsome G+ menace that posts the same thing to four different communities. Gross. Many of you have sent quite a few people my way, thanks ever so much.